Boil dal in 2 cups of water in a pressure cooker with a pinch of turmeric powder for 3 to 4 whistles. Check if the dal should become soft, then remove the cooker from the flame. Once the pressure released naturally, remove the lid and gently mash the dal with the back of a wooden spoon. Meanwhile, take tamarind in a bowl and add 1 cup of warm water. Keep it aside until the tamarind gets soft and pulpy. Squeeze out the juice from the pulp into the warm water and set aside after straining the whole tamarind water. Set a deep bottomed vessel on the stove and heat coconut oil. When the oil is hot add chopped onion, tomato and green chillies. Saute well until the onion becomes translucent. Add in chopped radish, stir- fry for 2 minutes. Then close the pan and cook the vegetables on medium flame. Once the vegetables are half cooked, add in cooked dal and mix well. Check bring to a boil. When radish gets tender add red chilli powder and coriander powder. Let it boil on low flame. Finally, add tamarind juice, asafoetida powder, fenugreek seed powder. Boil it for 10 minutes. For tempering, heat coconut oil in a pan and add the mustard seeds, when the mustard seeds pop, add the remaining ingredients. Fry till the red chillies change the colour. Pour this whole tempering to the sambar and immediately cover the vessel so that the flavours will remain in the sambar for a long time. Finally, garnish with chopped coriander leaves. 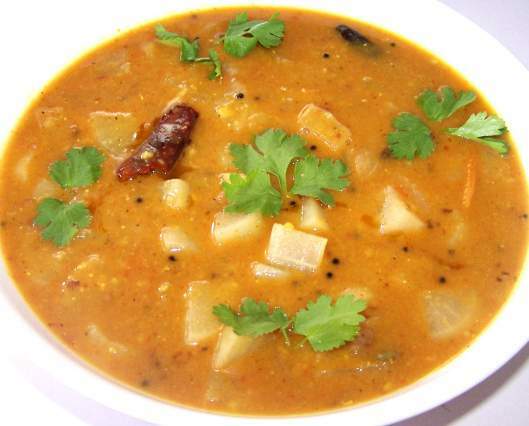 Delicious Radish sambar is ready, stir before serving.